Built ca. 1961 as a customs clearance room at the "Friedrichstraße" railway station, popularly known as "Tränenpalast" [tears palace] since it was there that East Berliners had to say good-bye to their visitors from the West. Closed 1989. 1991 converted to a theatre and concert hall, and officially named "Tränenpalast". Used for theatre and comedy performances, concerts and other events. 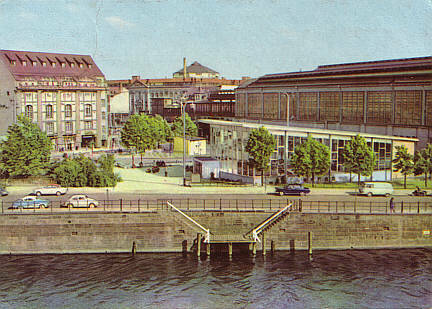 Reverse Text: "Berlin Hauptstadt der DDR, S-Bahnhof-Friedrichstraße"